Factor XIII deficiency is an inherited blood clotting disorder that affects females as well as males. In severe factor XIII deficiency, life threatening bleeding can occur, particularly intracranial bleeding. Factor XIII concentrates prevent and treat bleeds. Since this disorder is extremely rare, a person with factor XIII deficiency must be followed medically by a care team in a treatment centre that specializes in bleeding disorders. There is very little information available to people with factor XIII deficiency and their families. 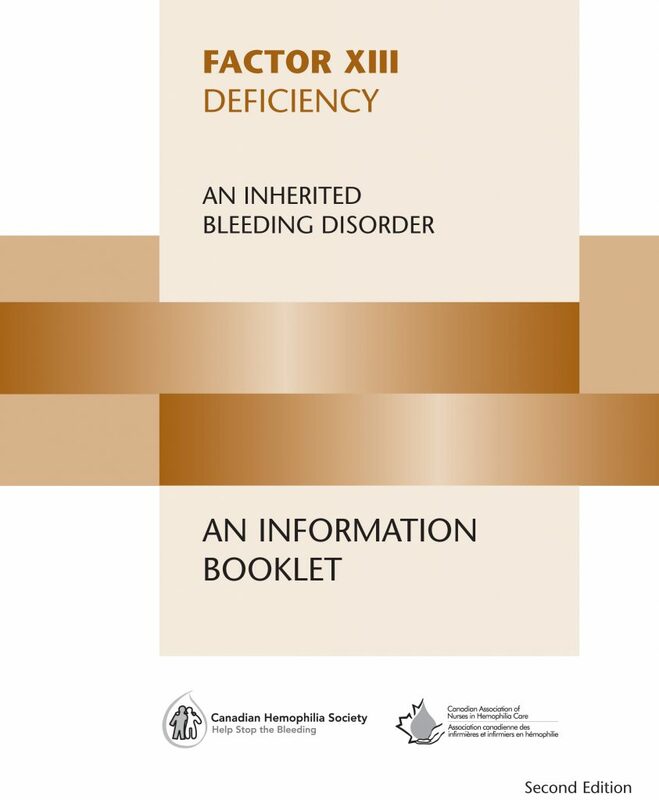 The purpose of this booklet is to describe this bleeding disorder and its treatment. We hope that it will help those affected to better understand their disorder and reduce its impact on their lives. In 1944, K.C. Robbins observed that an unknown factor in plasma plays a role in the formation of an insoluble fibrin clot. This was confirmed in 1948 by K. Laki and L. Lorand, who identified it as the “fibrin-stabilizing factor.” It has also been called the Laki-Lorand factor and L-L factor. In 1960, F. Duckert et al described the first case of fibrin-stabilizing factor deficiency in a young boy in Switzerland. In 1963, the International Committee of Blood Clotting Factors formally recommended the designation of factor XIII. Factor XIII deficiency is an inherited bleeding disorder. It is caused by abnormal genes that are passed on from the parents to the child at the time of conception. A carrier is a person who carries a single defective gene but is not affected by the disease. In order for a person to inherit factor XIII deficiency, one parent must have severe factor XIII deficiency and the other parent must be a carrier, or both parents must be carriers. In such cases, the child can inherit two defective factor XIII genes, one from the mother and one from the father. Therefore, if a person inherits the defective gene from only one of the parents, he/she will be a carrier. His/her factor XIII level will be below normal, but there will be no signs of the disease and they will most likely show no symptoms. Since factor XIII deficiency runs in families, and since the defective gene is so rare, there is often a history of consanguinity (marriage between close relatives) in cases of this disease. Blood is carried throughout the body in a network of blood vessels. When tissues are injured, damage to blood vessels may result in leakage of blood. Blood can flow out of a cut at the skin’s surface, or it can seep under the skin and cause ecchymosis (a bruise), swelling and/or pain. Clotting, or coagulation, is a complex process that makes it possible to stop injured blood vessels from bleeding. As soon as a blood vessel wall ruptures, the components responsible for coagulation come together to form a plug at the rupture. There are several steps involved in forming this plug. Blood platelets, which are very tiny cell fragments, are the first to arrive at the rupture. They clump together and stick to the wall of the injured vessel. These platelets then emit chemical signals calling for help from other platelets and from clotting factors. The clotting factors, which are tiny plasma proteins, link to form a network of fibres called fibrin. The strands of fibrin join together to weave a mesh around the platelets. This prevents the platelets from drifting back into the bloodstream. Then, factor XIII plays a special role in stabilizing the fibrin mesh by solidifying the individual fibres. Without factor XIII, the fibrin strands are fragile and individual fibres break away. And when this happens, bleeding begins again. transplant is not a cure. A bone marrow transplant can be considered. When a patient shows signs of unusual bleeding, a family doctor will often order several blood tests to assess coagulation. These tests measure the time it takes for a clot to form. The clot is a kind of mesh composed of strands of fibrin. In many kinds of bleeding disorders (for example, hemophilia A or B), a clot will take a long time to form and therefore the clotting time will be longer than normal However, with factor XIII deficiency, the clot formation takes the usual time – the clotting time is normal. Therefore, standard coagulation tests can be misleading and are not adequate for diagnosing factor XIII deficiency. person with factor XIII deficiency, even though there is a very real clotting problem. The quantitative test can also be used to determine if a person is a carrier. People who do not have factor XIII deficiency, nor carry it, have a factor XIII level of about 100% of normal. Carriers have a level of about 50%. People with factor XIII deficiency have a level of less than 2%. Factor XIII deficiency is an extremely rare disorder. It affects about one in a million people in Canada. It is found in people of all races and ethnic origins. bleeding in soft tissues (accumulation of blood under the skin), which takes the form of ecchymoses (bruises). All that is required to control and prevent bleeding is to increase slightly the amount of factor XIII in the blood. Because of the high risk of bleeding in the brain (intracranial hemorrhage), doctors recommend preventive treatment for people with factor XIII deficiency. Preventive treatment means regular infusions of factor XIII, even if there is no sign of bleeding. This therapy is called prophylaxis. from a blood transfusion is extremely small. However, a tiny risk remains. A blood donor who has been very recently infected by HIV or hepatitis B or C viruses may not yet have developed the telltale signs that permit his/her donation to be rejected. Plasma and cryoprecipitate can cause severe allergic reactions. This is because they contain many different components in addition to factor XIII. The quantity of factor XIII in a bag of plasma differs from one bag to the next, even when the amount of plasma is the same. This means it is impossible to know exactly how much factor XIII is being administered. There is very little factor XIII in a bag of plasma. To control or prevent bleeding, a large volume of plasma must be infused slowly over several hours in order to not overload the heart. Today, to treat factor XIII deficiency, factor XIII concentrate is used instead of plasma or cryoprecipitate. It comes in the form of a small vial of freeze-dried powder. When it is time for a treatment, sterile water is added to the vial and the powder is dissolved. It is then infused into a vein over a few minutes. This concentrate can originate from the pooled plasma of thousands of blood donors. It is called plasma-derived factor concentrate to differentiate it from recombinant factor concentrate, which is produced in laboratory using recombinant technology and does not originate from human or mammalian plasma. Since 2012, recombinant factor XIII concentrate has been available in Canada. The main advantage of recombinant factor XIII is that there is no theoretical risk of viral transmission. However, recombinant factor XIII is only effective for people with a deficiency of the A subunit, as it does not contain B subunit proteins. Therefore, blood tests need be performed to determine the patient’s type of subunit deficiency before using recombinant factor XIII concentrate, to make sure it is appropriate for use. Factor XIII concentrates undergo viral inactivation processes that kill viruses that may be present in plasma-derived concentrates and to ensure absolute viral safety of recombinant concentrates. Because of the greater purity of concentrate, allergic reactions are extremely rare. Factor XIII concentrate comes in a small vial and is measured in units. The exact quantity contained in the vial is clearly marked. It is easy to determine the exact dosage of factor XIII administered. The product is highly concentrated. The amount necessary to treat or prevent bleeding is diluted in less than 20 millilitres of sterile water. Therefore, there is little danger of overloading the heart. The treatment can be administered in just a few minutes. Like other proteins in our bodies, factor XIII has its own life cycle. It forms, lives and dies on a fixed timetable. In a person with factor XIII deficiency, factor XIII is not automatically renewed, since he/she lacks the gene required for its production. The factor XIII protein in factor XIII concentrate is similar to that manufactured by the body. It, too, has a limited life cycle. The term used to measure how long factor XIII concentrate survives in the body is half-life. The half-life is the amount of time it takes for half the infused factor XIII to be cleared from the bloodstream. To determine how long to wait between doses of factor XIII, its half-life must be taken into account. Plasma-derived factor XIII concentrate has a half-life of 9.2 days, while recombinant factor XIII concentrate has a half-life of 11.5 days. In other words, half of the factor XIII administered will have disappeared 9 to 12 days after its infusion. In order to control or prevent bleeding, the level of factor XIII must never be less than 5% of normal. The infusion of one unit of factor XIII concentrate per kilogram of body weight increases factor XIII levels by about 1.5%. For example, if a person weighing 50 kilograms receives an infusion of 20 units of factor XIII per kilogram of body weight (that is, 20 units/kg X 50 kg = 1,000 units), then the level of factor XIII rises by 30%, that is, 20 units X 1.5%. At 30% of normal, this person is well protected against bleeding. After about 10 days, the level of factor XIII in his/her blood drops by about half (30% divided by 2) to about 15%. This is because the half life of factor XIII is about 10 days, and half the factor XIII is gone. The patient continues to benefit from factor XIII protection. After another 10 days, that is 20 days after the infusion, the person’s factor XIII level again goes down by a half (15% divided by 2) to about 7.5%. This is still a satisfactory level of protection. After another 10 days (30 days since the treatment), the level of factor XIII drops to about 3.5% (7.5% divided by 2). The patient now needs a new infusion of concentrate to raise his or her factor XIII to a safe level. In other words, treatment every three to four weeks, with about 10 to 20 units per kilogram of body weight, that is, 500 to 1,000 units for an adult, is generally enough to ensure that there will be no abnormal bleeding. However, before deciding on a treatment program for a patient, a factor XIII half-life test is recommended. This involves infusing factor XIII concentrate, and then measuring factor XIII levels at regular intervals over a period of 30 days. These tests will tell the doctor what amount of product is needed so that the factor XIII levels never drop below 5%. The dosage and treatment frequency can then be adjusted to the individual patient. appropriate dose can be administered without wastage. A person with severe factor XIII deficiency should learn how to self-infuse factor XIII concentrate at home. Self-infusion has many advantages. It allows a high degree of independence. It removes the inconvenience of having to go to a health care facility every month. If a bleed occurs, the person has access to quick and efficient treatment without having to go to a health care facility. Factor XIII deficiency is a very rare disease. Few health professionals know much about it. At a hospital emergency department, precious minutes could be wasted studying the patient’s records, trying to reach the attending physician or running through long and tedious medical examinations. This may result in an unnecessary delay in the infusion of factor XIII concentrate while a potentially dangerous bleed continues. As soon as a person is informed of his/her diagnosis of severe factor XIII deficiency, he/she should receive a patient ID card specifying the disease, the appropriate treatment, and the name of the bleeding disorder treatment centre and telephone numbers of health professionals on the care team. In the case of an accident or emergency surgery, this card will be very helpful for the patient and the medical staff. A person with factor XIII deficiency who lives far from his/her treatment centre or who does not know how to self-infuse, should have a summary of his/her medical records sent to the nearest emergency care centre accessible at all times, usually the hospital closest to his/her home. The information should include the appropriate measures to take in case of bleeding or trauma that causes bleeding. A permanent prescription for factor XIII should be made available to the nurses so they can treat the patient right away upon arrival at the hospital, even before being examined by a doctor. Bring along the vials of factor XIII concentrate and information leaflet explaining how to reconstitute and infuse the concentrate, so that the emergency nurse can administer treatment as soon as possible. Otherwise, if these precautions are not taken, there can be an unreasonable delay in administration of treatment because factor XIII concentrate is not readily available in hospitals and the reconstitution device is specific to factor XIII concentrate. The development of inhibitors to infused factor concentrate is a complication that occurs very rarely in people with factor XIII deficiency, whereas about 30% of people with factor VIII deficiency develop inhibitors. Inhibitors are antibodies produced by the body to fight off and destroy infused factor concentrate, as it does with viruses or bacteria. The immune system does not recognize the new foreign protein, which is not produced by the body. The infused factor concentrate loses its effectiveness because it is quickly destroyed by inhibitors. Bleeding continues to flow without lessening despite treatment with factor concentrate. There is very little effective treatment to control bleeding in the presence of inhibitors. Inhibitor development is a very serious problem for people with factor XIII deficiency since 30% experience intracranial bleeding, which comes with a risk of permanent damage or even death. Therefore, efforts must be made to avoid this complication at all costs. If inhibitors develop, treatment to desensitize the immune system to factor XIII concentrate can be attempted. This treatment (called immune tolerance therapy) consists of frequent infusions of high doses of factor XIII concentrate and can be combined with other medications that reduce the activity of the immune system. The development of inhibitors is mainly a concern with the first infusions of factor treatment and also when there is a change in type of concentrate. Therefore, when initiating regular treatment with factor XIII concentrate or when changing the type of factor concentrate, blood samples to detect the presence of inhibitors are taken frequently (every three months). This type of analysis then needs to be done at the patient’s annual visits to the bleeding disorder treatment centre until the physician considers that the risk of inhibitor development has passed. People with factor XIII deficiency are considered to have hemophilia. As in other types of hemophilia, they bleed abnormally due to a clotting factor deficiency. However, the nature, frequency and treatment of bleeding in factor XIII deficiency are very different from other types of hemophilia. Umbilical and intracranial bleeds are much more frequent in people with factor XIII deficiency than in people with hemophilia A (factor VIII deficiency) or hemophilia B (factor IX deficiency). Joint and muscle bleeds are much less frequent in people with factor XIII deficiency than in people with factor VIII or factor IX deficiency. Preventive therapy (prophylaxis) is much more effective in people with factor XIII deficiency because of the longer half-life of this factor. The half-life of factor XIII is 9 to 12 days, whereas factor VIII half-life is about 12 hours and factor IX half-life is about 18 hours. The result is that there is almost no abnormal bleeding once factor XIII concentrate is administered in adequate doses at suitable intervals. However, it is strongly recommended that people with factor XIII deficiency learn to recognize the signs and symptoms of potentially life-threatening bleeds, so they can respond in a timely and appropriate manner. The majority of pregnancies in women with severe factor XIII deficiency end in miscarriage (spontaneous abortion), unless the patient receives factor XIII concentrate regularly during pregnancy. Among women who are carriers of factor XIII deficiency (but do not have the disorder), some studies have found the rate of miscarriage is higher than in the general population. The reasons why factor XIII is necessary for the continuation of pregnancy are not well understood. A normal placenta has high levels of factor XIII, which is believed to prevent uterine and placental bleeding and/or promote adherence and growth of the placenta. The duration and intensity of menstrual flow are the same in women with factor XIII deficiency as in women in the general population. Therefore, this disorder does not affect the menstrual cycle. However, as stated, it does affect the possibility of carrying a pregnancy to full term. In men, lower sperm counts (oligospermia) and lower infertility are sometimes associated with factor XIII deficiency. In general, the recommendations for a healthy lifestyle are the same as for people who do not have a bleeding disorder. Follow a regular program of physical activities suited to the individual’s preferences and capabilities, and adapted to individual circumstances. Use high quality sports equipment as required for different sports (helmet, elbow pads, kneepads, proper shoes, etc.). Eat a well-balanced diet; maintain a normal weight. Drink alcohol in moderation only. Preventive treatment provides excellent protection to people with factor XIII deficiency. Even so, here are some recommendations specifically for people with factor XIII deficiency. It is strongly discouraged to practice sports and activities with a high risk of injury to the central nervous system (head and spinal column) such as skydiving and bungee jumping. It is advised to discuss the choice of activities with the care team at the bleeding disorder treatment centre as some sports have a higher risk of injury to the central nervous system (head and spinal column) such as hockey, volleyball, soccer, baseball, or any sport involving a ball or object launched with force or hard contact with the ground, wall or other players. Anyone engaging in these risky sports should be sure to consult the care team and get personalized medical recommendations on how to treatment in the event of an accident that may cause bleeding. Then the necessary steps must be taken so that these instructions can be applied in an emergency. For example: Notify the coach or person in charge of the activity about the bleeding disorder and where the factor concentrate is stored in case of an injury. treatment centre can recommend a dentist who is thoroughly familiar with bleeding disorders. When surgery is planned, contact the treatment centre to plan appropriate preventive therapy. In case of emergency surgery, the physician on duty can contact a member of the treatment centre care team at any time by calling the telephone number on your patient ID card. Never take aspirin. Aspirin increases the risk of bleeding. It affects the way platelets clump together to plug a ruptured blood vessel. Always consult the care team before taking any new medication, medicinal-herb-based supplement, or vitamins sold over the counter. Wear a MedicAlert-type bracelet or chain and carry your patient ID card at all times to indicate that you have factor XIII deficiency. Always keep in mind the signs and symptoms of life-threatening bleeding – particularly symptoms of intracranial bleeding, which is common in factor XIII deficiency. If you are planning a trip, let your treatment centre know. You should have a letter from your doctor describing the medical supplies you have to take with you (syringes, needles and medication) so that you can cross borders without any problems. Make sure you have enough factor XIII concentrate for the duration of your trip. Obtain the addresses of treatment centres in the area you are visiting. Always stay in touch with your treatment centre. Children should be vaccinated on a timetable set by their pediatrician or family doctor. However, anyone receiving plasma-derived clotting factor concentrates should be vaccinated against hepatitis A and hepatitis B, ideally before starting treatment.